The key issue at stake in the battle over the twelve Danish cartoons of the Muslim prophet Muhammad is this: Will the West stand up for its customs and mores, including freedom of speech, or will Muslims impose their way of life on the West? Ultimately, there is no compromise: Westerners will either retain their civilization, including the right to insult and blaspheme, or not. More specifically, will Westerners accede to a double standard by which Muslims are free to insult Judaism, Christianity, Hinduism, and Buddhism, while Muhammad, Islam, and Muslims enjoy immunity from insults? 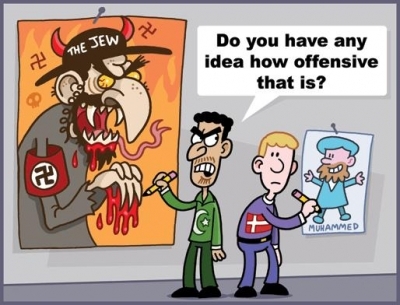 Muslims routinely publish cartoons far more offensive than the Danish ones . Are they entitled to dish it out while being insulated from similar indignities? Germany's Die Welt newspaper hinted at this issue in an editorial: "The protests from Muslims would be taken more seriously if they were less hypocritical. When Syrian television showed drama documentaries in prime time depicting rabbis as cannibals, the imams were quiet." Nor, by the way, have imams protested the stomping on the Christian cross embedded in the Danish flag. Norway: "We will not apologize because in a country like Norway, which guarantees freedom of expression, we cannot apologize for what the newspapers print," Prime Minister Jens Stoltenberg commented. Germany: "Why should the German government apologize [for German papers publishing the cartoons]? This is an expression of press freedom," Interior Minister Wolfgang Schauble said. France: "Political cartoons are by nature excessive. And I prefer an excess of caricature to an excess of censorship," Interior Minister Nicolas Sarkozy commented. Poland: "The bounds of properly conceived freedom of expression have been overstepped," Prime Minister Kazimierz Marcinkiewicz stated. United Kingdom: "The republication of these cartoons has been unnecessary, it has been insensitive, it has been disrespectful and it has been wrong," Foreign Secretary Jack Straw said. New Zealand: "Gratuitously offensive," is how Trade Negotiations Minister Jim Sutton described the cartoons. United States: "Inciting religious or ethnic hatred in this manner is not acceptable," a State Department press officer, Janelle Hironimus, said. Strangely, as "Old Europe" finds its backbone, the Anglosphere quivers. So awful was the American government reaction, it won the endorsement of the country's leading Islamist organization, the Council on American-Islamic Relations. This should come as no great surprise, however, for Washington has a history of treating Islam preferentially. On two earlier occasions it also faltered in cases of insults concerning Muhammad. In 1989, Salman Rushdie came under a death edict from Ayatollah Khomeini for satirizing Muhammad in his magical-realist novel, The Satanic Verses. Rather than stand up for the novelist's life, President George H.W. Bush equated The Satanic Verses and the death edict, calling both "offensive." The then secretary of state, James A. Baker III, termed the edict merely "regrettable." Even worse, in 1997 when an Israeli woman distributed a poster of Muhammad as a pig, the American government shamefully abandoned its protection of free speech. On behalf of President Bill Clinton, State Department spokesman Nicholas Burns called the woman in question "either sick or … evil" and stated that "She deserves to be put on trial for these outrageous attacks on Islam." The State Department endorses a criminal trial for protected speech? Stranger yet was the context of this outburst. As I noted at the time, having combed through weeks of State Department briefings, I "found nothing approaching this vituperative language in reference to the horrors that took place in Rwanda, where hundreds of thousands lost their lives. To the contrary, Mr. Burns was throughout cautious and diplomatic." Western governments should take a crash course on Islamic law and the historically-abiding Muslim imperative to subjugate non-Muslim peoples. They might start by reading the forthcoming book by Efraim Karsh, Islamic Imperialism: A History (Yale). Peoples who would stay free must stand unreservedly with Denmark. The cartoon above was drawn by J.J. McCullough of www.filibustercartoons.com and is posted with permission. For those who wish to "Buy Danish," a list of products to purchase can be found at End the Boycott. Related Topics: Freethinking & Muslim apostasy, Media, Muslims in the West, Radical Islam | Daniel Pipes receive the latest by email: subscribe to the free mef mailing list This text may be reposted or forwarded so long as it is presented as an integral whole with complete and accurate information provided about its author, date, place of publication, and original URL.